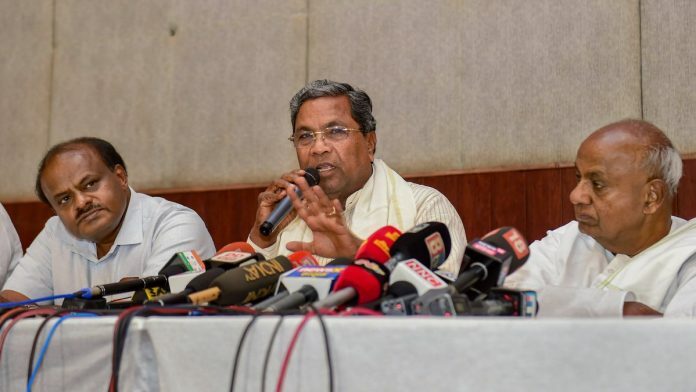 Bengaluru: The Congress and the JD(S) seem determined to not only combat speculation of a growing rift in the alliance but also address dissent on the ground that is threatening to derail the combine’s Lok Sabha campaign. The two parties Tuesday held a joint press conference to announce that they will launch their campaign for the general elections from 31 March but there was a bigger message in the optics — particularly to party cadre. The press conference was attended by senior leaders of both parties, including Karnataka Chief Minister H.D. Kumaraswamy, state Congress president Dinesh Gundu Rao and significantly JD(S) supremo and former prime minister H.D. Deve Gowda and former Congress chief minister Siddaramaiah, who was once Gowda’s most trusted aide before the two fell out. Part of the strain in the coalition government in Karnataka had been attributed to the uneasy relationship between Gowda, his son Kumaraswamy and Siddaramaiah. Siddaramaiah was once in the JD(S) and a close Gowda aide but their relations soured in 2005, in part as the former harboured CM ambitions. Siddaramaiah was soon expelled from the party as Kumaraswamy went on to become CM in 2006. Siddaramaiah, however, joined the Congress, a party he led to victory in 2013. He also made it clear that the alliance will not tolerate dissent on the ground. Gowda further said that issues in Mysuru and Mandya, where the Congress cadre has revolted over the ticket going to the JD(S), will be resolved. There was, however, no indication from leaders of both parties on whether there will be a rethink on the seat-sharing agreement that has led to the heartburn on the ground. Under the current agreement, the Congress is to contest on 20 seats while the remaining eight Lok Sabha seats in the state are with the JD(S). Karnataka is set for two-phase election with voting on 18 April and 23 April. The resentment on the ground is in southern Karnataka, particularly the Old Mysore region, where the BJP is a non-player. Elections here have been predominantly fought between the Congress and the JD(S) and Congress workers are upset with the party leadership for allocating the Tumakuru and Mandya seats to the JD(S). Similar protests from Congress workers have erupted in Tumakuru, where sitting MP S.P. Muddahanumegowda is from the Congress and will be unable to contest due to the seat sharing agreement.